Microwave butter in microwaveable 9-inch pie plate on HIGH 30 sec. or until melted. Add potatoes; stir gently to evenly coat potatoes with butter. Microwave 10 min. Whisk eggs, milk and pepper in medium bowl until blended. Stir in pepper Jack cheese; spoon over potatoes. Bake 20 min. or until knife inserted in center comes out clean. Sprinkle with cheddar; bake 3 to 5 min. or until melted. Sprinkle with bacon. 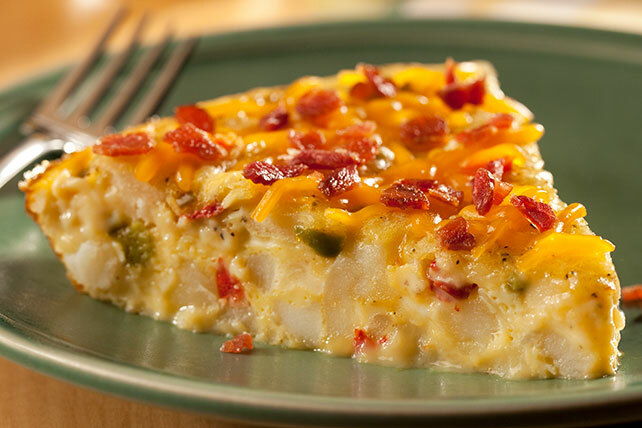 For a delightful brunch idea, serve this Egg, Potato and Bacon "Skillet Bake" with a seasonal fresh fruit salad. Substitute 1-1/2 cups cholesterol-free egg product for the 6 fresh eggs.